Hosta 'Eye Declare' is a fairly new addition to my shade garden. I bought it as a liner from the plant co-op I belong to. 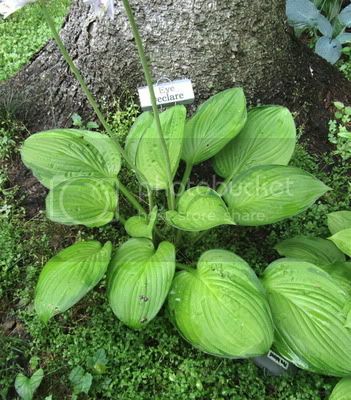 If you are not familiar with liners, they are very small hostas. They are often tissue cultures, and have one very small eye. They usually take a while to mature, because they are so small. You can usually purchase liners, especially from a co-op, for anywhere from $1-$8. It's a great way to save money, if you have the time and patience for the liners to mature. 'Eye Declare' has been a very fast growing hosta for me. The one in the picture below is only 2 years old, and started off as a very small liner. I love that it will have a random streak of green on a leaf. The picture below does not capture this hosta at its best. In spring this hosta is absolutely gorgeous. It's center is so bright, you would swear that it could glow in the dark. As summer progresses the center turns more green. Put this one up front, where you can admire it in spring. Hosta of the day - "Eventide"